My parents came out to visit me this week (they live in New Mexico and I live in Florida so we don't see each other often) and we decided to go canoeing through a state park not far from my house for something to do. I've been kayaking at this place several times and it's absolutely gorgeous so I couldn't wait to get out on the water and relax a bit. My parents were a bit skeptical about canoeing at first but I think they ended up having a blast and hopefully we'll go back out the next time they're in town. Since we were going to be outside I decided to be casual and comfy but still cute so I threw on a pair of jean shorts and this adorable sheer floral top from 4th & Ocean. 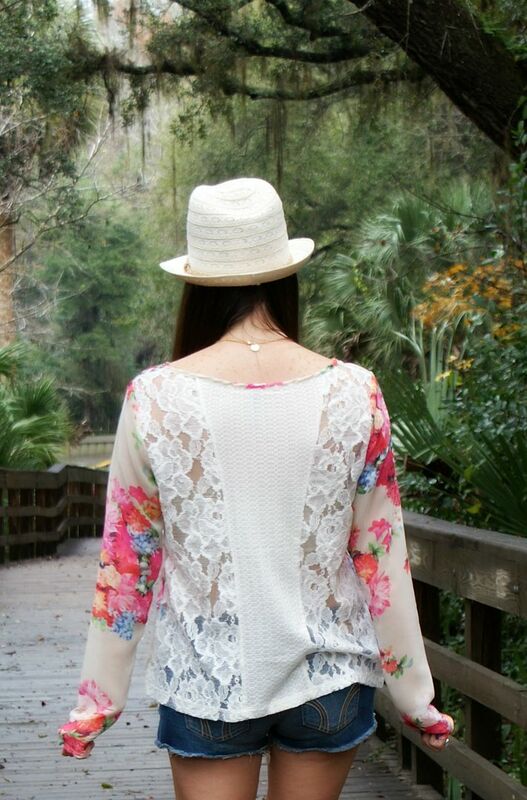 I LOVE everything about this top, from the floral design, to the colors and especially the back which is lace and crochet that gives it a romantic and girly feel. To top off the look I decided to throw on a cute open knit fedora I got from Forever 21 last year (it's been my go to beach hat) to keep my hair out of my eyes and what little sun we had away from my face and my fringe boots (which I took off for canoeing obviously!) 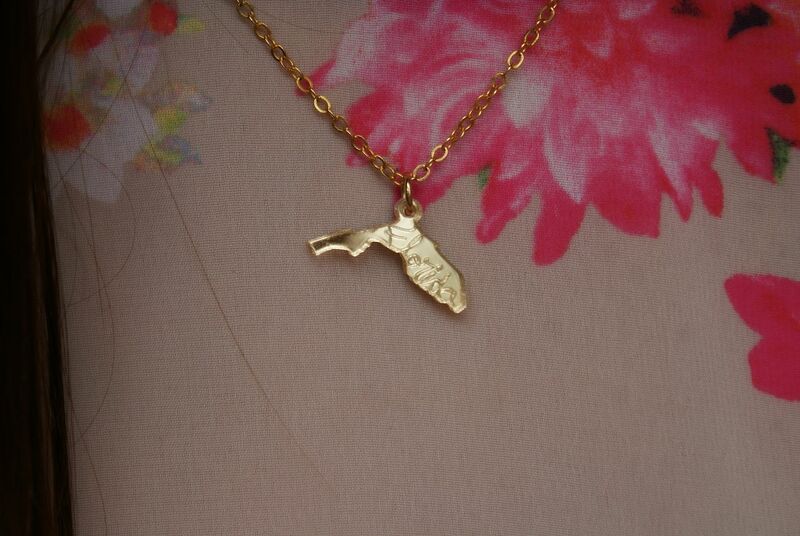 and another amazing creation from Vinca, the Florida state necklace. I had such an amazing time with my parents and I'm sad they're back home now but I can't wait to go back canoeing or kayaking this spring and summer and hopefully I'll be visiting them out west sometime this year! I love the necklace!! thank you so much for sharing - I'll have to add that to my birthday wishlist!! You can take the girl outta Florida but you can't take the Florida outta the girl!! I can't tell you how jealous I am that you're wearing shorts!! Love a good floral print. Thanks!! I'm kinda jealous you have snow! Pictures are always SO pretty in the snow... although I think if we got snow I'd be begging for the sun and warmth again LOL! Have you gotten threats already by posting pictures of being in shorts? 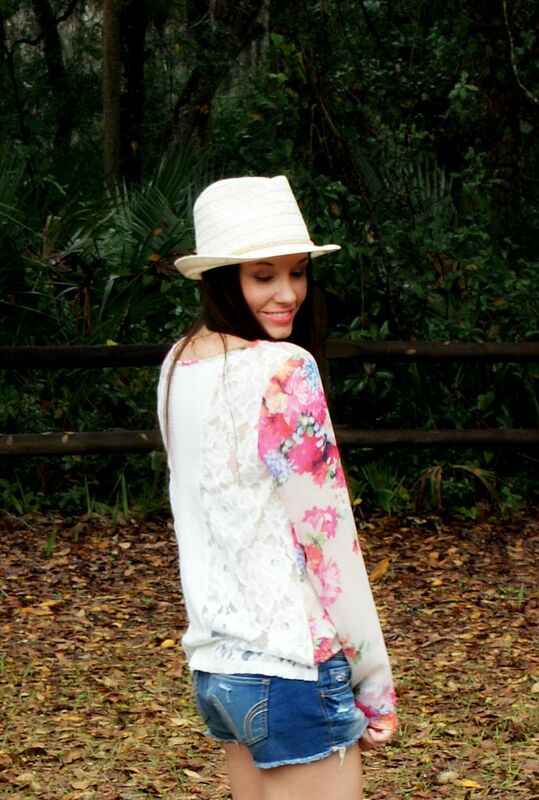 ;-) I love that floral top it is completely my style! Thanks!!! Yay!!! It's SO fun to meet other bloggers in Florida!! I feel like we're few and far between! Mine too! :) Thank you!! What a lovely outfit! Love the way the photos were styled! 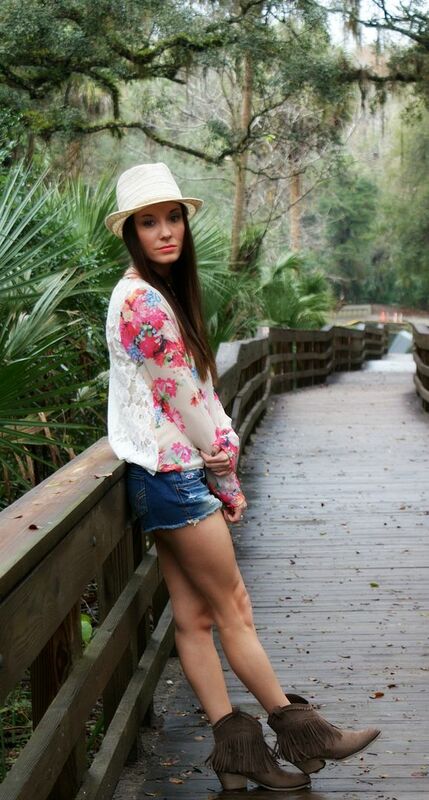 Adore this outfit--and holy cow look at those legs :) That hat is too cute on you too! I am glad you got to spend some time with your parents--sounds like a great day! That top is something else--and I love how it's from a brand that I've never heard of (love finding new stores and brands). I'm glad that you had a great time with your parents. I've heard from friends in Florida that canoeing there is a blast. Canoeing and kayaking through the springs is SO much fun! You'll definitely have to try it if you're ever here! I love finding new stores and brands too, it's like finding a diamond in the rough!